Suction cup mounting for extra stability. The B8® Impulse 45™ Electric Stapler is the ultimate supply for those who expect nothing but the best. It offers a unique blend of superior performance and sophisticated design, suitable for any office. If you have a high volume of stapling work and limited time, then you will love the Impulse Drive™ technology. It delivers 3x faster* stapling speeds, making you work go faster. This heavy duty electric stapler features a high performance drive system to stapler up to 45 sheets easily and consistently. Our innovative No-Jam™ technology puts an end to frustrating, document damaging staple jams. A refill alert light provides a bright visual indicator when it’s time to reload, and a push-button FastLoad™ magazine makes reloading faster. The integrated suction cup feet make for easy mounting and ultimate stability. No longer will your stapler move around during use! 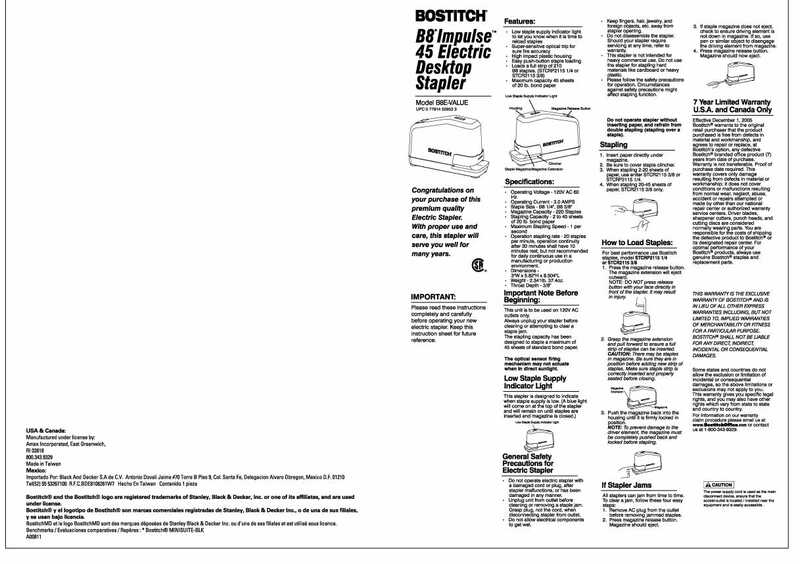 Plus, each of these Bostitch electric staplers comes ready for immediate use with 5000 B8® PowerCrown™ ¼ Premium Staples. These fastens are extra strong and feature a slightly crowned head shape that allows it to slice through 45 sheets of paper without breaking or buckling. If you're looking for a heavy duty electric stapler with a high sheet capacity, then this is for you! We have been using these for the last year. The first ones we had lasted about 6 months. The last few we have ordered they have done some changes and we are not even getting a month of usage before they are jamming and not working. Papers inserted several times before will work or it will put several at once. Need better quality as the prior were for the price. this stapler sounds like a air nailer. way to loud for an office environment. . I order this model for the pharmacy I work at. We do A LOT of stapling each day. The B8E-Value model is the very best! I would reccomend this electric stapler to anyone who's job requires them to do a lot of stapling throughout the day. You don't realize what you're missing using a regular stapler until you get one like this. Expensive, but well-worth it.